I decided to write a simple guide on how to install and uninstall user script on Firefox after many users keep on asking the same question. Step 1: You need to make sure you have Greasemonkey extensions installed on Firefox. If you want to download script from userscripts.org, just click on the Install button. If you download script from other website, you might want to save it your desktop and drag the script to firefox to install. Step 3: Click on the Install when Greasemonkey prompt you to confirm install the script to Firefox. Step 4: Done! Continue to read if you want to know how to edit the script. Step 6: Select the script you want to edit and click Edit button on the bottom of the dialog. If this is the first time you edit user script, you might prompt by Windows asking which software use to open the script. You should use notepad to edit the script (C:Windowsnotepad.exe). Step 7: Edit the script according your need and save it. Reload any page you want to apply the script on your Firefox for immediate effect apply. If you want to edit the script in future, just repeat the Step 5 until Step 8. 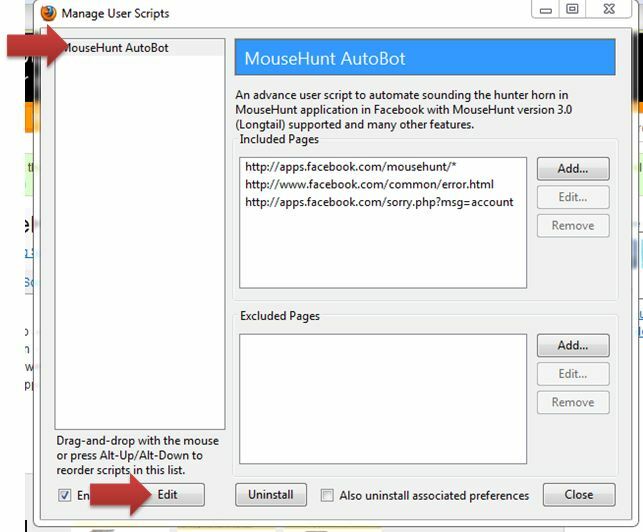 Step 2: Select the script you want to edit and click Uninstall button on the bottom of the dialog. Hope this post can help to save some trouble facing by the new users. Pingback: How To Install UserScripts in Firefox? I’m glad you like it. Well, the bot only use turn.php when the game screw up only. I don’t know why but when i reach king reward, there’s no sound, i try clicking the horn couple of time then it sound @_@. What should I do? I guess there is some delay on the horn before it sound. No worry, I got something else on next version. So stay tune. How can i know when the update release? 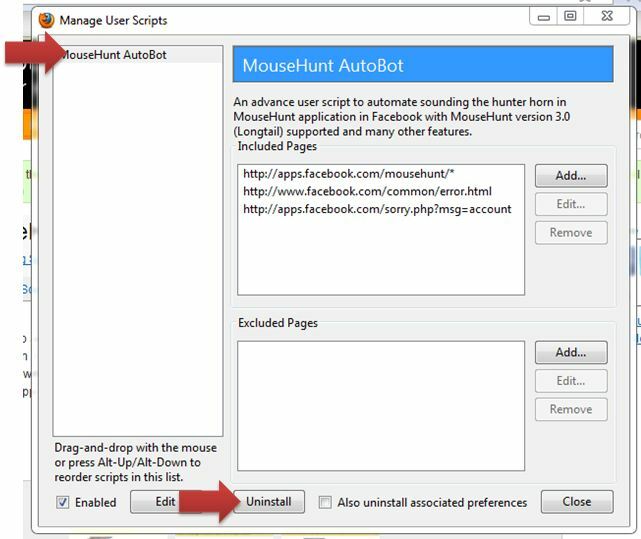 How come autobot doesn’t show on apps.facebook.com/mousehunt/ but only on mousehuntgame.com? Fix, check the latest 1.26 version. 😦 how do i download and use it? oh it dsnt install .. Does this work on a Mac? this is great!! :) does that work just when the computer is on? No, it only work with your computer on and web browser open.